Fairfield Prep's #15 Shane Dempsey tosses the ball to a teammate as he is tackled by Fairfield Co-op's #13 Joey Muratori, during rugby action in Fairfield, Conn. on Friday March 30, 2012. On Friday night, the Fairfield co-op rugby team did what it had never done before. Dawud Mohamed converted two penalty kicks and Mike Money scored the go-ahead try with 25 minutes left as Fairfield stunned Fairfield Prep 20-17 on Friday at Taft Field. "We knew we were going to win this one," Money said. "We wanted it so bad." Dan Skelton scored a try, as well, as co-op dealt Prep its first loss of the season, and also beat the Jesuits for the first time ever. "We knew we could do it, we just had to get over the mental part of it," Fairfield coach Bob Ehlers said. 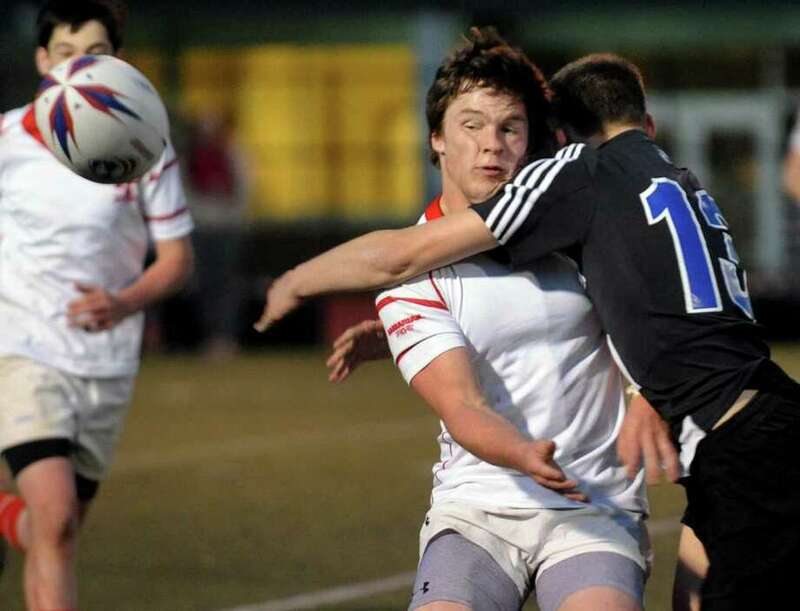 Joey Roberts scored three tries for Fairfield Prep as the Jesuits fell to 2-1 in the Division I season. "We made a lot of mistakes," Prep coach Frank Decker said. "But I give (Fairfield) credit, they stuck with it." Fairfield's defense dominated the second half, as the co-op club kept Prep off the board for the game's final 30 minutes. "We've got 22 kids on our roster and for the first time every one of them can tackle," Ehlers said. "If you can hold the other team from scoring, you have a chance." Fairfield recorded 17 of the game's final 23 points, boosted by Mohamed's two penalty kicks and Money's try with 23 minutes left. The senior forward lowered his shoulder, bulling through the Prep defense, as his teammates aided his progress. "It felt great to get the game-winning try," Money said. "I did it for the team." Prep controlled possession early, playing much of the first 20 minutes in the co-op's half of the field. A missed penalty kick in the fourth minute kept Prep from taking the lead, but in the 13th minute, Roberts took off from the 40-meter line, crossing into the goal area. Rusty Gough's conversion kick put the Jesuits ahead 7-0. Roberts' second took the ball from beyond the 40-meter line, crossing into Fairfield's goal area. Rusty Gough added one of two conversion tries, and Prep was up 12-0. "It was frustrating because we wanted to get out on top of them early," Ehlers said. But less than three minutes later, Skelton's try put Fairfield on the board, when he burrowed over the Prep goal area, with a push from Money and the rest of Fairfield's offense. "Once they got the confidence that they could play," Decker said, "they just played better than us."